WASHINGTON — The luster is off a bit for the Virginia-class submarine building program, long considered a model US Navy construction effort that routinely brings down the building time and cost for each successive sub. 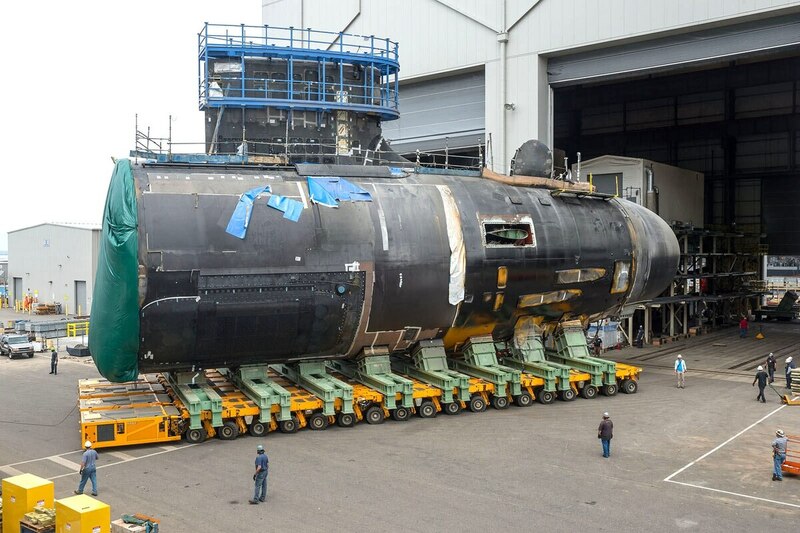 One submarine has just missed its contract delivery date — pushed back even more when sea trials were halted to return to port — and shipbuilders are working harder to keep construction on schedule. The problems come at a time when there is widespread support to continue building two Virginia-class submarines per year even when the Columbia-class ballistic missile submarines begin construction — when the Navy plans to go to three submarines each year. The situation seemingly came to a head March 2 shortly after the submarine Washington began its initial sea trials off the Virginia coast. The submarine, fitting out at Huntington Ingalls Newport News Shipbuilding, has been falling behind schedule for some time, missing a targeted summer 2016 delivery date and a scheduled Jan. 7 commissioning ceremony. More delays ensued in January when, according to the Navy, a problem was found with the hatch seating surface in the large lockout trunk access hatch, requiring a notice to Congress that the ship would miss its Feb. 28 contract delivery date and a rescheduled March 25 commissioning date. It's not the first time a Virginia-class submarine has missed a contract delivery date. The first two subs were late, and in late 2007 the North Carolina, the third Virginia, was delivered by Newport News seven weeks late because of welding issues. But since then, every submarine delivered by Newport News and Virginia class prime contractor General Dynamics Electric Boat has been delivered by the contract date or more often, earlier, causing something of a competition between the two yards. Rear Adm. Michael Jabaley, program executive officer for submarines at Naval Sea Systems Command, was aboard the Washington for the sea trials but would not specify the exact problem that caused officials to take the highly unusual move of cutting short the sea trials. Initial sea trials, he said March 9, are "a focused, two-and-a-half-day period where you certify the full capability of the ship from a propulsion, from a safety and recovery standpoint." If an issue comes up that impacts the ability to continue trials, he said, "you're coming back in. And that's what we did. "We're working through this particular issue, and the delivery and commissioning date for the Washington is under review as a result," he added. "But my estimation is that we'll come through it relatively quickly." But even with the sub's late delivery, Jabaley remains hopeful that by the end of the completion cycle — including post-delivery tests and a nearly six-month-long post shakedown availability overhaul – the planned date by which the completed, ready-for-operations submarine is turned over to commanders will still be met. "Washington will deliver very close to schedule," Jabaley said, "and at delivery to the type commander she will be as early or earlier than almost any other submarine we've delivered in terms of getting her to the type commander as an operational asset." So far, the Navy said, costs are not rising. "The last nine Virginia submarines, (New Hampshire SSN 778 through Illinois SSN 786) have all been delivered under target cost and within Navy budget," Jabaley said. "Current projections are that all remaining Block III submarines (Washington SSN 787 through Delaware SSN 791) will also deliver under target cost and within Navy budget." But larger issues affect the program. The 2011 ramp-up from one to two submarines ordered each year strained the shipbuilders and the submarine industrial base. Electric Boat and Newport News, who share equally in building each sub, had to hire more workers, injecting a level of inexperience into their work forces with a consequent rise in the amount of work needing to be redone. Some parts suppliers have struggled to keep up with increased demand, and late deliveries and quality problems have become more frequent. "Both shipbuilders hired additional people to account for the increase to two submarines per year," Jabaley said. "As a result, obviously when you bring in an influx of new people your level of experience goes down. "There is always a certain amount of rework in any manufacturing endeavor, and submarine construction is no different," he said. "It is something we monitor closely. We knew there would be what we call the green labor effect as we went up to two per year. But we have in general satisfactorily come through that." The building schedule has also been significantly reduced since the first four Block I Virginias were contracted for an 84-month building period, reduced to 74 months for the six Block IIs. The eight Block III subs — those currently under construction — are set for a 66-month building times, and Block IVs will be reduced further to 62 and then 60 months. The first three Block IIIs were delivered by the contract date, Jabaley noted, but the streak was broken with Washington. Sources noted concerns that Colorado, the next submarine to be delivered from Electric Boat, is challenged to meet her Aug. 31 delivery date, but Jabaley expressed confidence the program would work through its problems, declaring that, "at this point, Colorado is on schedule and we're working very hard for her and subsequent ships — Indiana's the one after her — to meet their contract delivery dates." The late delivery of the Washington is "not indicative of a systemic problem," Jabaley said. "What this is is a recognition that we have challenged the shipbuilders. "The Virginia class continues to be a high-performing program with each successive submarine delivering with improved quality, less deferred work, and reduced acquisition cost." The shipbuilders acknowledge they are dealing with issues on the program. "When technical issues are encountered during the construction process, the shipbuilders take this very seriously," said Electric Boat president Jeff Geiger. "We aggressively work to correct issues and put processes in place to prevent recurrence. Ongoing process improvements are key to continuing to reduce construction span times and costs. "We are committed to continuing to produce the highest quality submarines for the Navy, on time and on budget," Geiger added. But one noted Congressional analyst sounded a note of caution. "The Virginia class program in recent years has been described as a model acquisition program in terms of cost reduction and meeting delivery schedules, so this information goes against that grain," said Ron O'Rourke of the Congressional Research Service. "It's also is a reminder that ramping up production rates for submarines or other types of ships isn't a cakewalk — it can lead to challenges at shipyards and supplier firms. Those challenges can be met and overcome, and industry officials will tell you that they welcome those challenges, but doing so requires attention."